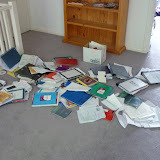 So I went through all my school stuff and ditched everything, and took some photos and snarky captions along the way. Behold, the summation of five years of education! In other news, I spent Saturday at a TEDx Youth talk organised by one of the Year 10s. I was helping out with recording the conference (it should be online here as soon as Tyrone is done editing, which... well, soon is probably the wrong word. Eventually.) Anyway, it got me thinking about a couple of things. The first was that actually, all things considered, I actually found the setup and recording and 'behind the scenes' aspects of the talk more interesting than the talks themselves, which says more about where my interests lie than it does about the quality of the speakers, who were amazing. The second is that I'm insanely annoyed that this year's year 10 ATPs managed to pull off something like this when the consensus is that we were clearly a much better year (although that consensus does come from us :P), and I realised we pretty much wasted a terrific opportunity in that year 10 ATP class. We could have done anything: protests, talks, conventions, flash mobs (I think there was a time freeze maybe)- anything - and Pengers and Britton wouldn have run with it and helped us do something incredible. Instead we pretty much pissed away the year on self-referential humour and making fun of mainies. The lolwall was pretty cool though. The third thing is that TED talks are cool, but like any cool thing, they have a tendency to get appropriated by a sort of hipster-esque intellectual subculture, where they start turning into motivational talks, confirmations of the audience's non-conformism, system-hating and intellectual superiority, rather than the genuine attempt to spread brilliance which they should be. Not that this event was at all like that, but I think there's a genuine danger of losing a great institution to intellectual masturbation, and that would be sad. So yes. That's it. I've deliberately tried to avoid screaming "I'M FREEEEEEE" from the rooftops cause I have a feeling that wouldn't be very interesting to read and in any case that's the kind of banality that Facebook statuses are for, right?